Alignment lugs are a must for any multipart mold as alignment is necessary for a resin pour to have a decent out come. This is for those (myself included) who don't always plan ahead with the first part pour and end up having to cut into the rubber to make some sort of indent for a lug. 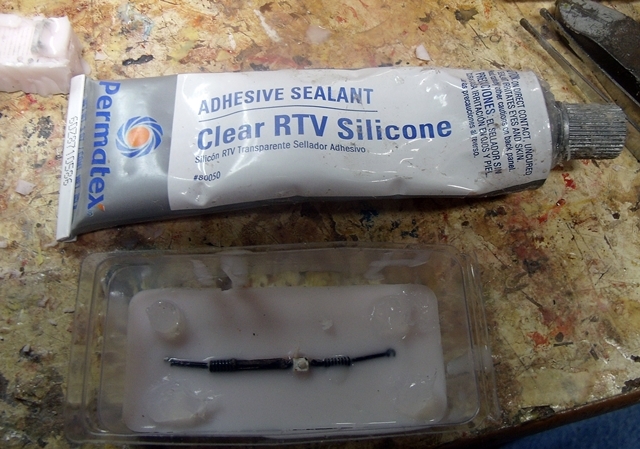 Automotive type RTV Silicone......I use Permatex...if its good enough for high performance racing engines I'm fairly certain it will do good here as well. I simply applied a small amount to each of the 4 corners in this 1 of a 2 part mold. Since it is a RTV Silicone just like what was poured, it bonds to the mold to make a nice, solid lug. Automotive RTV Silicone comes in different colors for different applications as far as mechanical machinery is concerned thus prices will vary...what you need to look for is either the clear or the Black color as they are the basic RTV Silicones. This is what I use to also make spot repairs to molds. You can find this product at better automotive parts stores anywhere. Plain ol' silicone caulking (with dish soap and water acting as the catalyst) also works for the lugs. Just be sure to use "silicone I" and not "silicone II" as II just makes a mess and does no good. We do a lot of work on the house and have it handy more often than anything (other than Liquid Nails) so it's what I use in a pinch. Also the clear is better than the white, the color pigment in the white acts funny and it sets up a little odd to me but the clear has no such problems.